For the 4th year we present a meta data analysis of the predictions made for the coming year by industry experts. 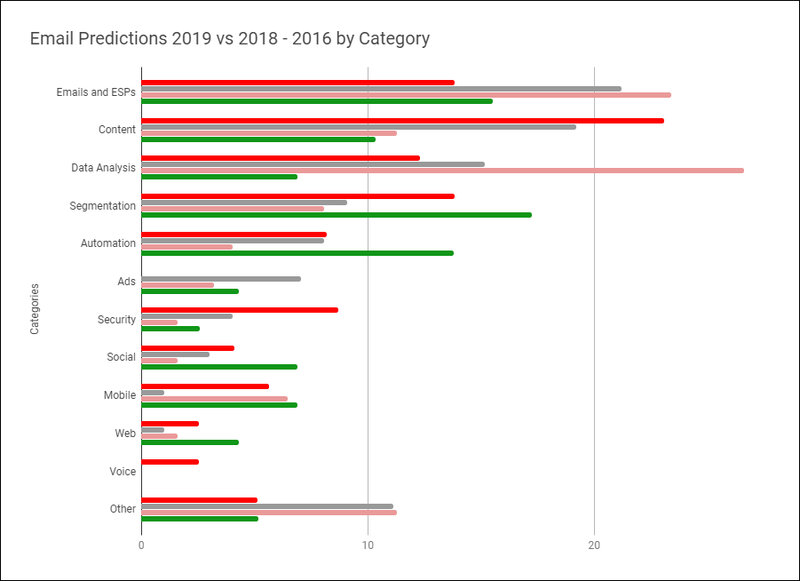 This year we gathered 195 predictions and categorized them as presented in the chart below. For charting purposes, we normalize volume to 100% so we can determine which are the main areas of discussion. The main topics of discussion this year were Content, Segmentation, Emails and ESPs, and Data Analysis. We will discuss each category in more detail below. The link below the chart provides source information for the predictions. For ESPs it is good to recognize the shifts in consumer demands and the segments that are focused on by marketers. Winners will be those that provide means for easy interactions with direct to consumer subscription models, the consumer desire for video consumption and tools for account-based marketing. ESPs with CRM functionality for advanced segmentations, pre-built segments, and cross-channel communications are the order of the day. Marketers will need to be good data managers to be successful, but thanks to AI and predictive analytics, success is easier to obtain. Predictive analytics are becoming the keystone for predictive automations and email campaigns. Chatbots are utilizing AI and machine learning to assist in answering routine questions for website visitors and decreasing the overall sales cycle and increasing customer satisfaction.